There are 48 images in the three Gallery pages. 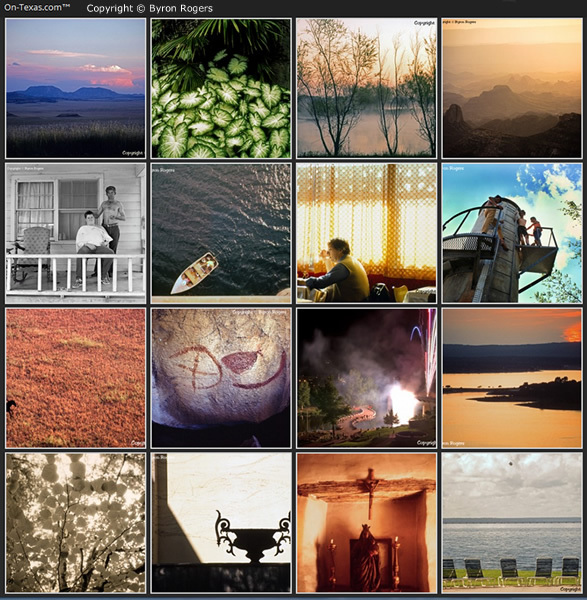 Each Gallery has 16 photographs in thumbnail form like the below image. When you click the smaller thumbnail you get a page showing the complete photograph along with more information such as the year it was made. The 48 images on the website are a select group from the total that makes up the On Texas Photographic Essay. Most of the images are from color or black and white transparencies. For now there are two negatives Haircut and Roller Skate Tent on the site. There are also two digital captures Lightfall Celebration Bridge and Oak Tree and Hay Bales. There are four Polaroid print images also Shadowman ; Buckner Boulevard Drive-In ; Charles Pebworth and Ann by gorilla. What this means is most of the photographs on the website where originally made on film and especially Kodachrome color reversal film. There are some Agfachrome, Anscochrome, Ektachrome, Fujichrome and Panatomic-X processed as B&W transparencies as well. Let me know if there are any problems on the website and I will try to correct them as soon as possible. You can leave comments on each photograph in the site for now. I may turn off comments if there is too much spam. I will look through my negatives as soon as possible and make selections for On Texas Photographic Essay.